Over the years, their friendship has been evolving—and Jimi is starting to wonder if they could become more than friends. But Del is obsessed with becoming a chimera: a person with animal features, achieved by splicing animal genes into their own DNA. It's a dangerous and controversial process, provided illegally by back-alley doctors called genies. The dramatic physical changes chimeras go through have scared lawmakers into drafting legislation to declare chimeras officially non-human— taking away all protections under the law. When Del goes missing, Jimi is desperate to find him before he alters himself forever. To save him, Jimi must risk her life—all while knowing that if getting spliced is the choice Del has made, it means he’s leaving her behind forever. Unlikely allies and powerful enemies clash as Jimi questions her beliefs and uncovers closely-guarded secrets about her own past. Set in a near-future society where technology is redefining what it means to be human, Spliced is part science fiction, part political thriller, raising questions about genetic modification and how we treat each other that will stay with you long after the final page. Jon McGoran has written several books for adults, including the D.H. Dublin series and the eco-thrillers Drift and Deadout, which Publishers Weekly called "outstanding" in a starred review. Jon McGoran is also a founding member of The Liars Club, a blog for and by writers. 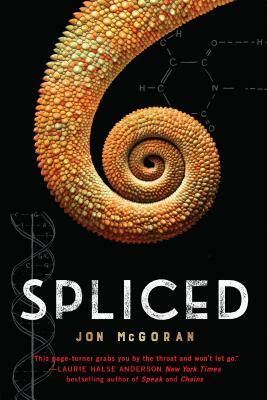 Spliced is his first book for young adults. He lives in Pennsylvania with his family.